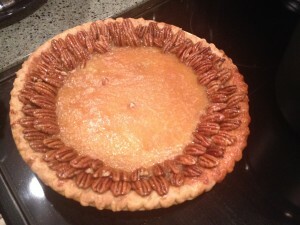 Combine butter, sugar, and light corn syrup over low heat until sugar dissolves. Cool slightly, add eggs, vanilla, and salt, mix well. 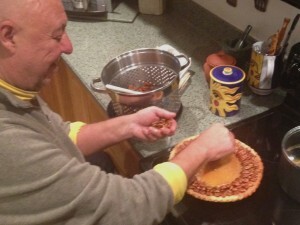 Add pecans turning gently as to not break the pecans. Secret Step: Pour this entire mixture into a colander and strain from nuts. 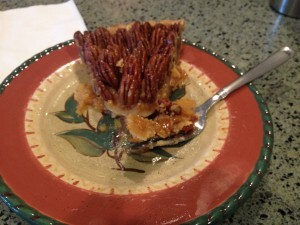 Set Pecans aside and pour remaining mixture into unbaked, deep dish pie shell. 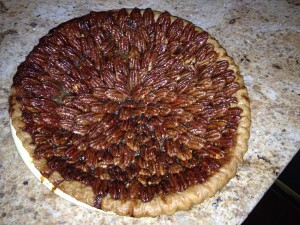 Bake at 325 degrees for approximately 35 minutes, or until mixture sets enough to place pecans on top without falling into the mixture. 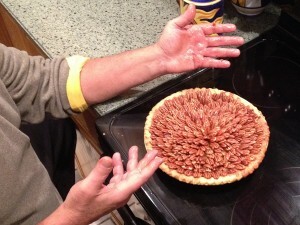 Starting at the edge, place pecans in a spiral fashion overlapping each row. Return to oven and finish baking 20 to 40 minutes at 325 degrees. You’re welcome Callie, thanks for your comments.